We drove the eight miles of forest service road to park near the trailhead, and found cars parked along both sides of the road since the main parking area was full - so much for wilderness solitude! We hadn't actually expected to find any doing the Coleman-Deming route on Mt. Baker with a good weather forecast, so there wasn't much disappointment involved. 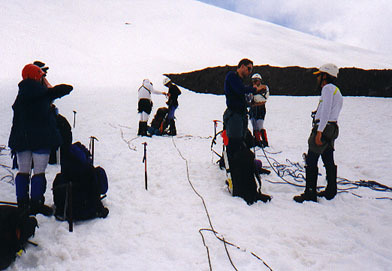 Our original plan had been to ascend the Boulder Glacier route, but after a large avalanche on Mt. Rainier a few days earlier that just happened to occur at the same aspect and the same slope steepness as that route, we switched our plans and decided to climb up the opposite side of the mountain. Missing our turn off and driving all the way to the Mt. Baker ski area before realizing it caused us to get a bit of a late start - we weren't on the trail until almost 12:30! We weren't too concerned, however, since there is a wealth of good camping spots from 5500' to 9000', depending on how much time and energy you have, and how long you want your summit day to be. We hit snow at around 5000', and then climbed off of the snow onto the hogback. 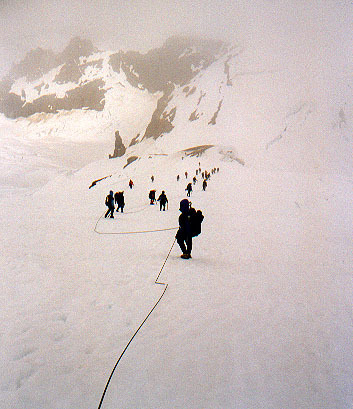 At the top of the hogback we stopped to rope up, noticing that there were a fair number of climbers continuing up onto the glacier unroped. Oh, well, to each their own, I suppose. A long zigzag trough had been trampled into the soft snow on the glacier's surface, and there was a pretty good line of folks using that. We decided we could probably move faster by taking a straight line up the first steep slope of the glacier, and were able to move out in front of some of the larger groups that were ascending. The glacier levels out as you approach the Black Buttes at about 7000', and we started thinking about calling somewhere near there home for the evening. We'd gained just about half the elevation to the summit from the trailhead, and that seemed like a fair split - full packs at lower elevations for half the distance, and summit packs at higher elevations for the second half of the trip. 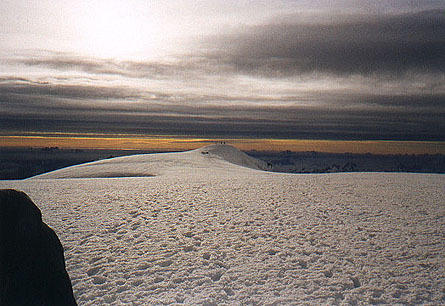 We climbed up a short snow bank to pitch our tents above the crowds, and to afford a little nicer view. The mountain played peek-a-boo with us, hiding in the clouds, then scooting them all away to display the impressive Roman Wall, with its bright red bands. We carved a nice kitchen into the snow wall behind our tenting area, then took a short walk up the exposed rock ridge above us to admire the views in all directions - west to Bellingham, Puget Sound and the San Juan Islands, south to the Thunder and Easton Glaciers and the Twin Sisters range, east to Mt. 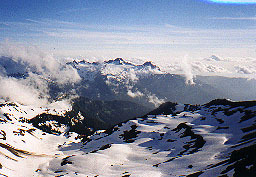 Baker itself, and north up towards Canada, with many jagged peaks serrating the horizon. Wanting to get an early start in the morning, we headed back down and fired up three stoves to start heating water for dinner - our wilderness camp sounded like the flight deck of an aircraft carrier for a while! After loading up on calories, and melting enough snow so everyone had water for the morning (and a hot water bottle for their sleeping bags!) we turned in around 8:00, with an alarm set for midnight. Midnight came all too soon, and I was awakened by the general rustle of folks getting ready for an alpine start. One member of our party didn't feel well, so we redivided the rope teams from 3 teams of 3 to 2 teams of 4. It took a little while to get everything changed around from the day before, so we didn't end up heading out of camp until almost 1:15. There was a moon low in the southern sky, hidden behind the mass of Mt. Baker, but between that and the starlight it was easy to make out many of the mountain's features. The lights of Bellingham were easily visible, as was the silvery surface of Puget Sound. We were the first group up this morning, and so had the pleasure of imagining we had the mountain all to ourselves (except for the trough of footsteps we were now gladly following - the snow which had been slushy in Saturday afternoon's sun was now frozen solid, and we avoided having to kick steps or walk in crampons by following the way used by hundreds before us). We angled a little too far toward the mountain, eventually losing our "staircase", and dead ending ourselves at a large crevasse. While trying to find a snow bridge over the crevasse, one member of our team managed to break through a thin snow bridge up to her shoulders and wedge herself into the crevasse. With a little assistance, however, she was able to free herself, but we lost almost half an hour here. Our next strategy worked well - we headed back down the mountain and towards the Black Buttes until we came on the trough of steps again. Falling into these we proceeded to march, mostly silently, up the mountain, toward the moon. At about 9000' we came up to the plateau where the Coleman and Deming Glaciers meet - here we finally broke into full moonlight, but the dawn had started by now as well, and the eastern horizon was glowing with pinks and yellows, slowly fading the moon out. We turned east and headed up the upper slopes of the Deming Glacier, walking along a short exposed rocky ridge, and then onto the final steep headwall before the summit plateau. Our stair steps disappeared about half way up this wall, and we ended up doing a little step chopping, and some delicate tip toeing up this final steep section - I was wishing I'd put my crampons on before starting up this, but the middle of the slope was a little late to realize this! This was the point we also started to be passed by several other parties who had slept in a bit later than we had - all the parties I noticed had elected for crampons and were able to move up the slope much more sure footedly, and much more quickly, than we were. No matter, 30 minutes later, at about 6:30, we were cresting out onto the summit plateau, with the summit bump of Grant Peak only a couple of hundred yards vertical and 40 feet horizontal away. After a quick stop to unrope, and put on a few more clothes (the wind was quite relentless) we took the stroll over to the top of the mountain and snapped the obligatory summit shots. We paused for a few more minutes to admire the view of the major peaks of the North Cascade poking through a cotton layer of low clouds before deciding that the winds were making the summit a really unpleasant place to be this morning, and that it was time to head down. 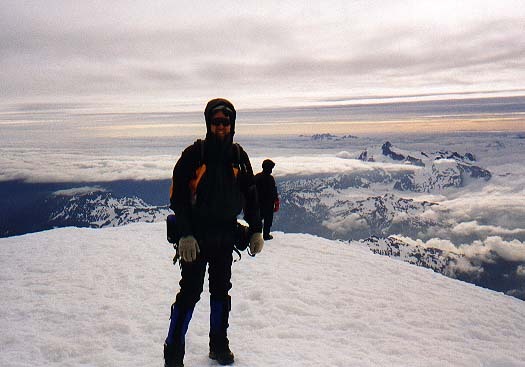 We donned more clothing, ate some snacks, put on our crampons, and roped back up. Descending the slope that had taken us so long on the way up was much more straightforward with crampons - the major difficulty was avoiding the long lines of climbers who were now heading up towards the summit! After a minor equipment failure (one of my crampons tried to take itself apart), we were down next to the exposed rock ridge at 9500', where we removed our crampons and grabbed a little more to eat. 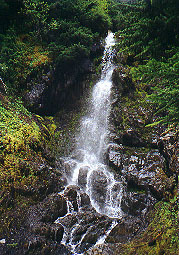 The remainder of the descent was uneventful, if a little tiring. The winds continued to build, and the clouds moved in to remove the views. Temperatures warmed up enough to start melting the snow which gave us a loose, slippery surface to at times surf down. 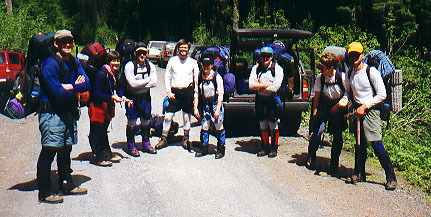 We were all pretty tired once we rolled back into camp, but we only spent enough time to melt some more snow so we'd all have water for the hike out, and to pack all our overnight gear back into our packs. 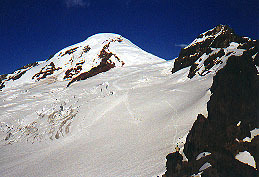 The descent off the glacier went quickly, with only one glacial plain and the final steep slope to cross. The snow remained slippery on the way down, giving us a few opportunities to practice team arrest as one or the other of us stumbled and started slipping. With the easy runout below us, this was all done with much more of a humorous attitude than a serious one, and less than an hour after we broke camp we were unroping on the edges of the snow field just above the hog back leading down into the forest. 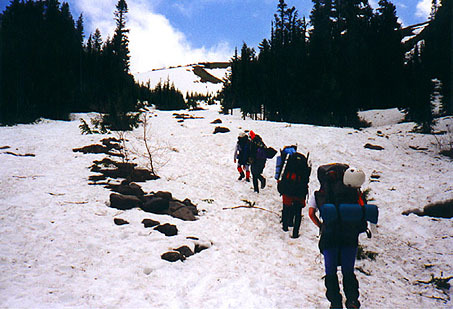 Most of us plunge stepped the first snow field along the hog back (a few braved the notorious "Black Hole" at the base of the first snow field and glissaded), then jumped into the glissade trough at the top of the second snow field for the next several hundred feet of descent. A long 2 miles later we arrived back at the parking area, our sore feet and tired legs happy to rest for the three hour drive home.